Photo by Jamaalism from the Torontoist Flickr Pool. The rise of Uber and similar ridesharing companies has dominated urban mobility discussions since the late 2000s. Many Torontonians are still processing the fallout from the epic battle between the technology company and our city’s taxi industry. In that struggle, Uber presented itself as an upstart underdog, keen to give urban residents new ways of getting around and being unjustly stymied by a hidebound regulation system. Regardless of the truthfulness of this argument, the message received a fair amount of traction and contributed to the City partially caving to Uber’s demands. More recently, Uber and ridesharing generally have taken aim at public transportation markets in North America. Some will remember the UberHop experiment here in Toronto; vans were driven on semi-fixed routes during rush hour. The service charged higher fares than the TTC but it was aimed at attracting professionals tired of crowded transit service. While this service ended in July, the idea that ridesharing can compete with transit continues to spread quickly, and is beginning to dovetail with the views of those who envision autonomous vehicles will negate the need for investment in alternate modes of transportation. It would seem that some transit operators are beginning to believe some aspects of this argument. Some U.S. transit authorities, including fairly large ones in Dallas and Atlanta, are partnering with Uber to offer service in suburban areas that currently do not have ready access to useful bus service. The agreements are pitched to the public as equitable partnerships and innovative ways to improve transit, particularly in suburban areas. This may be true in some situations, especially in exceedingly low-density areas of the city that can make it difficult to provide bus service. However, most of the media coverage to date has lacked criticism of the model. Is it truly possible to offer a useful bus service in areas where the Uber partnership is operational or is such an agreement merely a politically expedient excuse to not fund transit in the first place? Do Uber’s strong-arm tactics in cities where it begins operations (like operating illegally until its public relations department can drum up enough public outcry for local politicians to concede the fight) recommend this organization as a genuine partner to public transit operators? In Toronto, some politicians are jumping on the “Uber as transit replacement” bandwagon. As reported by the Star, the TTC is considering the implications of a report requested by Deputy Mayor Denzil Minnan-Wong (Ward 34, Don Valley East) that studies the implications of having ridesharing companies replace bus service in suburban and industrial areas. Although the report from City staff will be balanced in its appraisal, Minnan-Wong is already on record as supporting the proposal. Having a councillor so close to the mayor in favour of such a change does not bode well for the future of transit in Toronto. To begin with, Toronto is a fundamentally different city than the places where the model is being implemented. Looking at the entire GTA region, population density can be measured at about 849 persons per square kilometre; the Atlanta region has an average density of only 243 persons per square kilometre. Density is not the only determinant of good transit, but as a general measure it shows that here in Toronto we are far from the low-density metro areas where ridesharing as transit is being experimented with. Important to note is that these numbers are for the entire metro region, meaning that places like Scarborough and Etobicoke, while far from being transit paradises, are many orders of magnitude more dense than comparable suburbs south of the border. Toronto suburbs. Photo by Jack Landau from the Torontoist Flickr Pool. Even more telling is the ridership on many of our suburban bus routes. The 134 Progress route, travelling from Scarborough Centre RT station out to Morningside Heights in Scarborough’s northeast, garnered over 7,000 riders on weekdays in 2014. This route, traversing some of Toronto’s most outer suburbs and industrial areas, attracted nearly 3,000 riders on Sundays. Similarly, a route like the 117 Alness, out in the industrial areas near York University, attracted 2,300 riders. 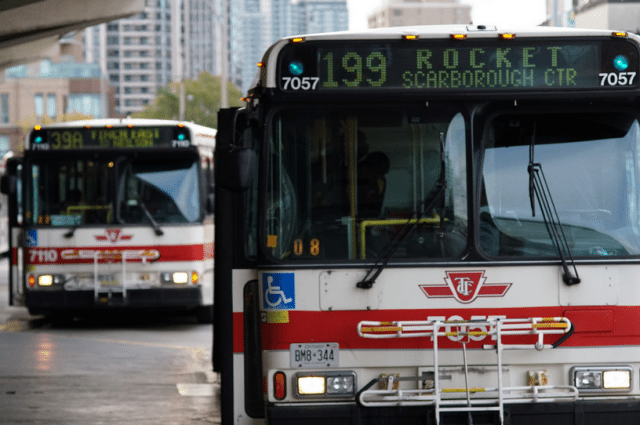 While certainly less than the Progress route, it is still an example of how transit service far outside of the downtown can gain decent ridership in Toronto. This level of demand is not easily replaced with ridesharing vans. 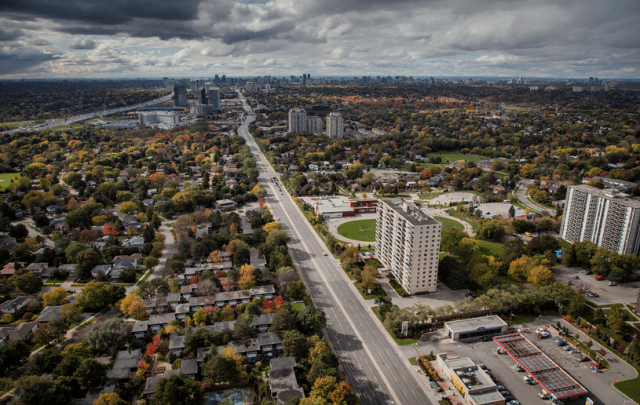 Toronto’s relatively dense suburbs are linked by a successful grid network of buses, which means that even those routes that travel through an industrial area or single family neighbourhood will also connect with a tall apartment complex or busy strip mall somewhere else down the route. Additionally, connections can be made to other buses at arterial road intersections and rapid transit stations, giving riders from “low-density” areas relatively easy access to the entire network. In spite of all the troubles the TTC faces, this use of a grid network is the strongest aspect of the system and continues to drive impressive ridership in suburban areas. What would happen if we replaced part of these routes with a ridesharing service? Would people want to wait for a van by the side of the road, get driven around to all the passengers’ destinations, and then miss their fixed route bus connection because of that? We need to be careful not to undermine existing strengths within the system. In fact, even low-density metro regions have seen success when their transit networks are reorganized from the typical low-frequency suburban winding routes to a grid system similar to Toronto’s. For example, Harris County Metro, which provides transit to Houston and its inner suburbs, recently completed an entire system redesign. It implemented frequent routes based on a grid system so as to provide reliable transit to more areas of the city. Houston is not a dense metro area by any means and yet ridership is increasing at record levels. This was achieved without any use of Uber partnerships. What would happen if, instead of giving up on offering good transit, Atlanta, Dallas, and their peers chose to have the courage to invest in their systems instead? Ridesharing is no substitute for a well-funded, high-service transit network, and we should fight to ensure for the latter to best serve Torontonians.